Medicare Supplement Plan K is one of the cost-sharing plans available to Medicare beneficiaries. 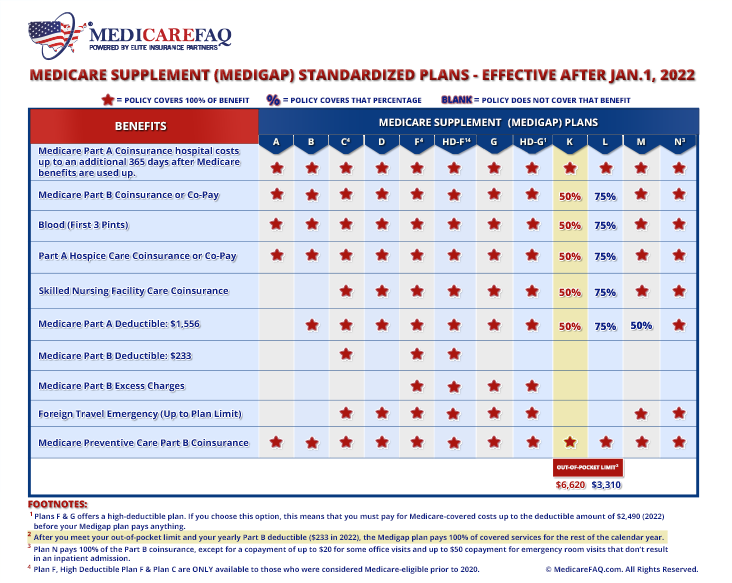 Plan K has many of the other benefits that Medigap Plans offer, but with a much lower premium. Each year, enrollment into Medicare Plan K increases. This is due to more beneficiaries willing to share more costs, if in return they have a reduced monthly premium. Medicare Supplement Plan K will cover 100% of any Part A coinsurance and hospital costs for an additional 365 days. As for the rest of the benefits that fill in your gaps in coverage, Plan K will cover 50%. The Part A deductible is $1,364, that means beneficiaries enrolled in Plan K are responsible for $682. The Part B deductible is $185. Part B excess charges are only added if the provider does not accept Medicare as fully payment. However, most do, excess charges are not common. Some states don’t allow them. Medigap Plans do not cover routine dental, vision, or hearing services. You would want to add on a stand-alone DVH plan to supplement your Medicare Plans. Medicare Plan K does have an out of pocket maximum, or cap on spending. The out of pocket maximum for Plan K in 2019 is $5,560. The OOP limits increase annually. If you’ve had employer health coverage, these out of pocket maximums are comparable in the terms of how they work. If you reach to out of pocket maximum within that calendar year, then Plan K will pay 100% of any medical expenses going forward. Medigap premiums are determined using many different factors and pricing methods. It’s important to know that regardless of the carrier you choose to enroll with, the benefits will remain identical. The only difference between carriers and Medigap plans is the monthly premium. The average premium for Plan K is anywhere between $40-$100. It could be less, or more, depending on where you live. You must be enrolled in Original Medicare Part B to be eligible for any Medicare Supplement Plan, including Plan K.
Depending on your state, if you’re enrolled in Part B due to aging into Medicare or a disability, as long as it’s in effect you can enroll in a Medigap Plan. When it comes to Medigap Plans, you can enroll at any time. Unlike Traditional Medicare, it doesn’t have Annual Enrollment Periods. However, if you enroll during the first six months after your Part B is in effect, you’re granted guaranteed issue. With guaranteed issue, you won’t have to answer medical questions and are guaranteed acceptance into the plan. This time period is called your Medicare Supplement Open Enrollment Period. If you miss this period, you can still enroll into Plan K, you’ll just have to go through medical underwriting. What you don’t want to do is wait on enrolling into Part B. Part B does have a late enrollment penalty for each year you don’t enroll after you first become eligible. Same does with Part D for prescription drug coverage. Medicare Supplement Plan K has 5-star reviews, just like all the other letter plans. The reason they all have great reviews is because they cover anything that Medicare covers. They’re also guaranteed renewable as long as you pay your premiums each month. The only time beneficiaries have an issue with Plan K is when they start incurring medical expenses and must pay the shared costs before their benefits kick in. If this is something you’re not prepared for, then I would consider an alternative plan to Plan K.
Keep in mind, you may have higher out of pocket costs due to the plan only covering 50% of most the benefits. Depending on your budget, and the level of benefits you’re looking for, there’s alternative options to Plan K that may suite your healthcare needs better. There are two other cost-sharing plans you can choose from that will still give you a lower premium, Plan L and Plan M.
Plan L works the same exact way that Plan K does. The only difference is that everything Plan K covers at 50%, Plan L will cover 75%. Plan M is the cost-sharing plan that gives you the least amount of cost-sharing. Plan M will cover all the same benefits as Plan K and Plan L, but at 100%. The only benefit that’s not 100% covered is your Part A deductible. You’re responsible for 50% of that deductible. Technically, there is one more cost-sharing plan, Plan N. I say technically because it works a little differently than the other cost-sharing plans. Plan N will pay 100% of the same benefits as Plan K, the only cost-sharing you’re responsible for is a small co-pay for doctor visits and emergency room visits. If you’re looking for the same amount of benefits, all covered at 100%, then Plan G is the runner up. Plan G is the second most popular plan among beneficiaries. It’s runner up to Plan F.
Plan F is considered a first-dollar coverage plan, as well as Plan C. These two plans cover the most benefits of all supplement plans. However, more coverage comes with higher premiums. If you’re expecting to have higher medical expenses, then choosing a different plan then Plan K will give you lower out of pocket costs in the end. However, if you’re overall healthy and don’t see your medical expenses being more than your budget, then a cost-sharing plan like Plan K could work for you. Some big changes are coming in 2020, including the elimination of first-dollar coverage plans. Both Plan F and Plan C, as well as High-Deductible Plan F, will no longer be offered to those who become Medicare eligible after 2020. If you’re Medicare eligible before 2020, you can continue to enroll into any of the first-dollar coverage plans after they’re eliminated. You can read more about this here. Plan K is not offered in all states, and not all carriers offer this plan. Due to this, it’s not easy for beneficiaries to compare rates without the help of a licensed agent. At MedicareFAQ, we work with all the top carriers in your area. We can provide you with rates on all the plans available where you live, with all the carriers that offer it. Our services are 100% free to you. We’re here to educate you on all your Medicare options. Call us today. Or use our rate comparison tool to compare all plans and carriers in your area now.